Now there is a fun Dumbo Plush With Music that the little once will like. 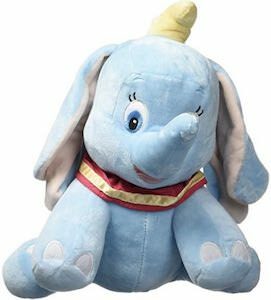 This Disney plush is a 11.5 inch tall plush version of Dumbo the flying elephant and the animal looks adorable with its big ears and hat and there is more as you can wind the plush up and then it will play music to your child. The music Dumbo plays is Baby Mine and I am sure that will impress the little once and as it does not need batteries it will be always be ready to go when ever you wind it up. A cute plus like this will be loved by kids for many years and will be a great addition to the collection of plush animals in your home. 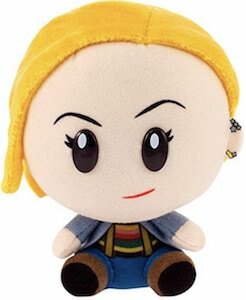 Now there is a cute SuperBitz 13th Doctor Who Plush. True fans of Doctor Who that like to collect amazing pieces will love this plush version of the Doctor. The plush is of the first female Doctor Who and she is wearing her famous outfit she wore in her first series and she even has her earrings and her nice blond hair. 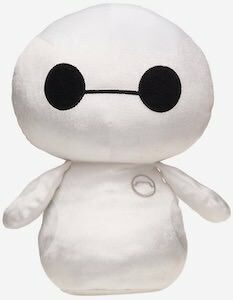 And this plush can be used for kids to as it is rated ages 5+ but it is great for adults too. The 4.5 inch tall plush comes in a nice Doctor Who themed box with a window and that means that you can keep the Doctor in new condition but you can also just choose to cuddle with it. 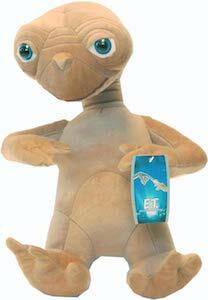 Now you can own an alien because this a Plush ET. We all know E.T. from the famous classic movie E.T. The Extra Terrestrial and he has some fun body features like his hand and neck and all can be found on this plush doll of the alien. The E.T. 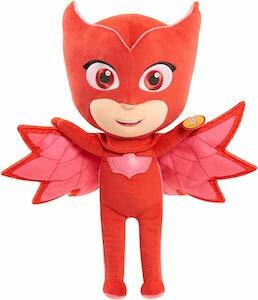 plush is 12 inches tall making it great for when you need a hug and don’t worry this plush won’t be calling home and no spaceship is going to pick him up. The plush is made for ages 3 and up and does make a great piece for in your entertainment room or just in the bedroom with all the other plush creatures you own. 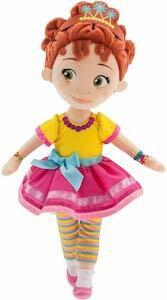 Now anyone can own their own Fancy Nancy Plush Doll. This is a doll of Nancy and she is 1.35 inches tall and all soft and cuddly. Fancy Nancy is wearing a fun pink skirt and yellow shirt and in her hair you can see a tiara all made from soft materials to make this a fun toy for kids ages 3 and up and yes it is fun to have as adults too because they can love Fancy Nancy too. 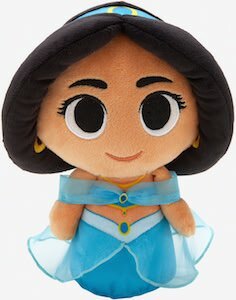 If your child can’t choose between a doll or a plush then they don’t have to choose with this toy as it is a plush doll and it looks amazing and fun. The unmistakable look of a Grinch, green fur, green tuffs of hair, lanky body and a face only a Grinch could love. Bring home your very own young Grinch toady. This plush is from Universal Picture’s and Dr. Seuss animated film of Grinch the Movie. It is of a young Grinch with a lot of embroidered details and find the classic red and white scarf this Grinch is wearing. Made to be durable and last a long time while also super soft to cuddle with, the Grinch stand 15 inches tall and is the perfect gift for kids or a great collectors item to display. What is a Bowtruckle you ask, well it is a Fantastic Beast that seems shy and cuddly but can pick any lock for you. Seen first in the great movie Fantastic Beasts And Where To Find Them. 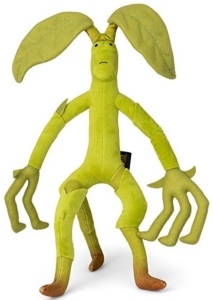 The Bowtruckle plush features an all light green soft material with lots of detail from long fingers, friendly face and stitched ears making this a one of a kind Bowtruckle. This Bowtruckle plush is made to be very durable and long lasting while super soft to cuddle and hug. Officially authorized by Warner Brothers and made by the Noble Collection it stands 13 inches tall and is perfect to watch the movie series of Fantastic Beasts. Niffler, a creature from the cool movie of Fantastic Beasts and Where To Find Them. The Niffler is a pesky little beast that is attracted to shiny things like coins and gold. 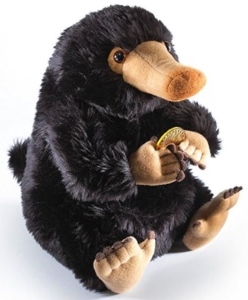 Here is the perfect way to show off how much you agree with this Niffler Plush. The Niffler beast plush is super soft and made with a lot of detail from the cute face, long snout, pointy fingers and toes and of course the small tail. It is officially authorized by Warner Brothers and made by the trusted name of The Noble Collection so you know you are getting quality and accuracy in your Niffler plush from the movie Fantastic Beasts And Where To Find Them.